Olimpia Milano will exhibit its history, the one beginning with a “scudetto” in 1936, the very same year the club was founded according to an idea of the visionary president Mr. Adolfo Bogoncelli. On Sunday, when Cimberio Varese will come to the Mediolanum Forum. Olimpia will provide its fans a little surprise under… the rafters: the banners remembering all the victories and trophies of its extraordinary history, exhibited year by year filling and entire rectangle in the sky. 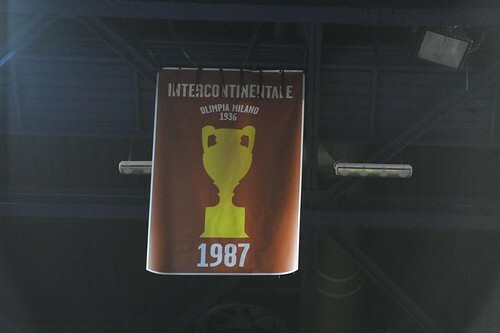 When all is said and done, 39 banners will fill the rafters celebrating 25 Italian titles, 3 Champions Cup, the Intercontinental Cup won in 1987, 3 Cup of Cups, 2 Korac Cups and 4 Italy Cups. Another special banner will celebrate the 20 youth titles won, another Italian record. “We thought – Olimpia EA7 Emporio Armani Milano President Livio Proli said – that the game against Varese, an historical rival for many years of tie-breaking games, was the perfect opportunity for us to start showing what we are as a club, what we won and want to keep honoring together with our fans, hoping soon to add some more banners”. All the banners are red and visible from every corner inside the building. The very same banners will be exhibited eventually in the new Olimpia’s home, the former Palalido, as soon as it will be available.